The Project covers an area of 14 km2 and is located in the Bowen Basin in Central Queensland, approximately 30 km west of Moranbah and 130 km southwest of Mackay. The Project consists of Mineral Development Licence 444 (“MDL 444”) and Exploration Permit for Coal 830 (“EPC 830”). BMA’s (BHP Mitsubishi Alliance) Daunia Mine is located to the immediate west, and Peabody’s Moorvale West resource is located to the immediate north of the Project. 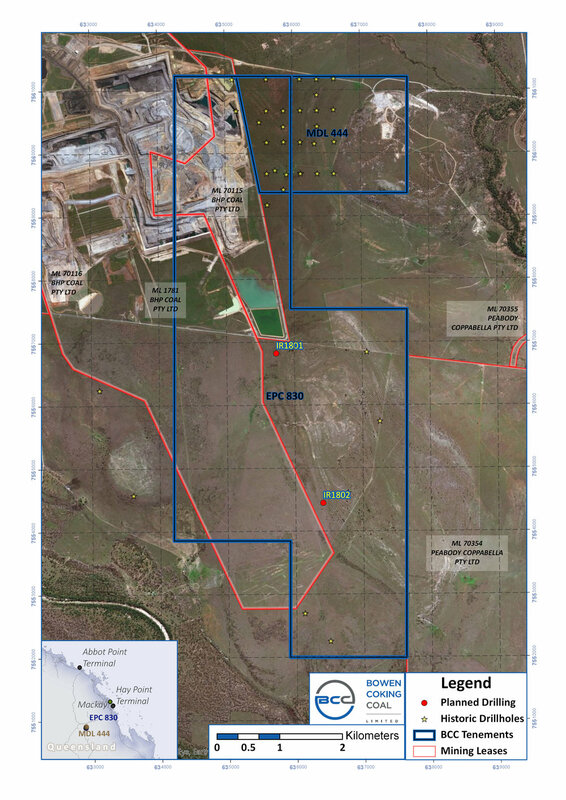 EPC 830 occurs south of MDL 444 and abuts Peabody’s Olive Downs North Project (subject to a transaction with Pembroke Resources), and is approximately 3km North of Rio Tinto’s Winchester South project. The Project is well located relative to regional infrastructure with the Peak Downs Highway located 12km north and the Goonyella rail system within 3km of the Project. MDL 444 was first granted on 1 February 2012. The term of MDL 444 has since been renewed, and the current term commenced on 1 February 2017 and ends on 31 January 2022. EPC 830 was first granted on 9 July 2003. The term of EPC 830 has since been renewed, and the current term commenced on 9 July 2016 and ends on 8 July 2019. The Project is prospective for coal from the Leichardt seam in the Rangal Coal Measures. The Leichardt seam is the main target seam and is extensively mined in the area by numerous operating mines. The target seam was intersected in several drill holes on MDL 444 between 35m and 142m deep with seam thicknesses varying between 2m and 5.5m. (See table 1 below). The Vermont seam was also encountered in several drill holes, but is not a priority target at the moment due to lower quality, but could provide some blending optionality to proximate mines and projects. Indicative coal quality and washability analysis have been conducted on hole E830041C only by A&B Mylec Pty Ltd, which indicated the potential for an 8.9% ash semi-soft coking coal product with a secondary thermal coal product (6900kcal air dried) at a combined total simulated yield of 87%. Further quality tests, blending options and washability analysis are planned for 2018. No Resource estimate has been completed in accordance with the JORC Code; however, the Company will consider in the near future further exploration data to be acquired and the analysis to be undertaken in order to report such an estimate. The area is well known for geological structure and intrusions which will also require further exploration. A section of EPC 830 is overlain by BMA’s Mining Lease 1781 for the Daunia Mine in the South (which section is excluded from EPC 830). ML 70115, Daunia East also directly abuts MDL 444, as can be seen in Figures 1 and 2. Daunia targets the same seams from the Rangal Coal Measures (Leichhardt and Vermont) and extracts the seams via open cut mining. Drill holes and seismic lines close to the western boundary with Daunia have demonstrated the continuation of those seams into Isaac River.